The staff at Texas Tumbling and Trampoline Institute (3TI), Inc. is dynamic and highly experienced. We have creative activities for your children to grow physically, emotionally and cognitively. Contact us if you have any questions. We look forward to hearing from you! We have exciting events lined up for you! March 18-22 7:45 a.m. to 5:30 p.m.
Ninja Camp- More information to come! Learn more about our trampoline, tumbling, cheer & Ninja classes that we have lined up for your children. You're kids will LOVE IT! Along with our amazing and fun classes, our team can help you organize your child's birthday party. Our staff will ensure that everyone at the event has a BLAST! 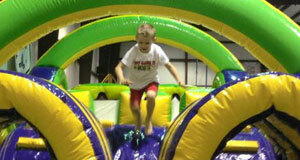 School or other groups (such as church groups) have terrific parties at group rates! We are proud to serve the community of Paris, TX. If you have any questions regarding our services, get in touch with our team via email to 3tikids@gmail.com or call at 903-739-9140.